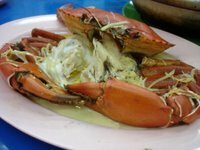 I have been meaning to seek an alternative to Mellben to beat the lines and still have my crab and I think Uncle Leong is the answer. Managed by the younger brother of the owner of Mellben, it serves the same tasty rich crab noodle soup that Mellben does. I was told that the other house special was the butter crab with pepper. 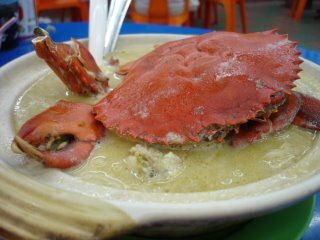 But we opted for a regular steamed crab instead and found that to be sweet and firm to the bite. Useful that Uncle Leong is right across from Mellben. Dinner for three was S$76 / US$47.50. Its good to call ahead for a reservation. But bring cash though, they dont take credit cards.